Temperature increases significantly change the mechanical properties of steel. At 400 °C, steel’s yield strength is reduced to 60% its initial value. It has been proven that a steel structure subjected to heat can no longer perform its load-bearing functions after a certain amount of time, and will collapse. The temperature at which this occurs is called the critical temperature. The critical temperature will change depending on the weight of the initial load and will depend on the admissible level of stress and the nature of this stress. – 500 °C for compressed elements or elements subject to bending and axial compression. – 540 °C for isostatic beams and tensioned elements. – 570 °C for hyperstatic beams. Section factor S/V expresses the relationship between the surface exposed to thermal flow S [m2] and the volume of an element by length unit [m3]. Its value considerably influences the behaviour of the structural element when exposed to fire. An element with an S/V quotient [m-1] with a low value will heat much more slowly than an element with a high section factor. It will therefore be more resistant to fire. 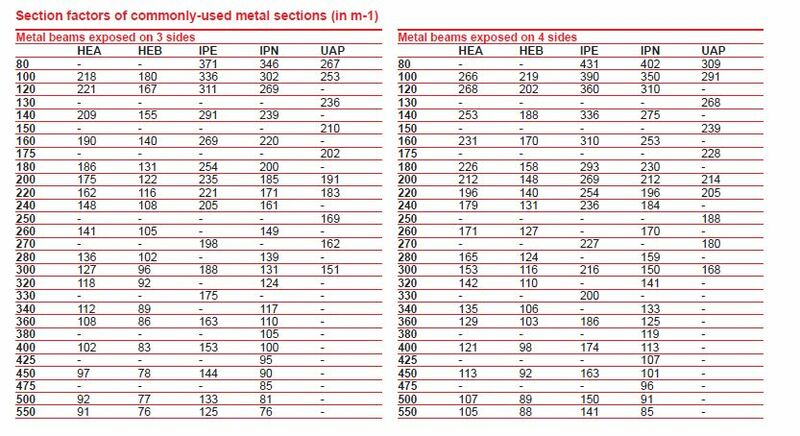 The following table provides the section factors for the commonly-used metal sections for beams exposed on 3 sites and posts exposed on 4 sides. For other types, contact Projiso’s technical department. A fibrous coating around a metal structure slows the heating speed of the steel, thereby improving its behaviour when exposed to fire. The base is untreated or rustproofed steel; while our products do not increase steel corrosion, a base treated with an alkyd or epoxy primer is recommended for long-term resistance to corrosion. For other base types, consult Projiso’s technical department. The base must be clean, dry, free of dust, rolling residue, rust, oil or any other contaminant that may affect adhesion. A suitable primer must be applied before the fire protection coating is applied. On the following pages, you will find examples of installation thicknesses.